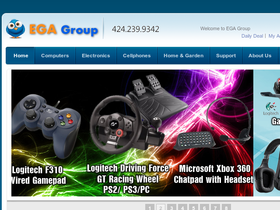 EGA Group, online at egagroupusa.com is a leading direct-to-consumer eCommerce website specializing in providing electronics and computer product. EGA Group carries thousands of products with the finest value, quality and the lowest available price in the market. The wide variety of products sold includes cell phones, laptops, monitors, keyboards, mouses, speakers and much, much more! Not only will you find great deals and prices but also receive free shipping within US, and for the best savings visit 58coupons.com to checkout out current EGA Group coupons, discounts and promotions. Shop at EGA Group today and enjoy free shipping on your order. Follow this link to get started. Save 5% on orders from EGA Group when you use this code at checkout. Click link and start shopping. Act now and save $1.50 off the purchase of a Microsoft Notebook Laser Mouse 6000 (B5W-00001) with this coupon code exclusive to 58Coupons. EGA Group sells a great selection of cellphones starting as low as $44.99. Click link to visit the store today.